Thursday, 1 November 2018, 4:10p.m. The Australian Government has been quietly relocating asylum-seeker children from Nauru to Australia, and there are unofficial plans to have all of them moved by the end of the year. "Children have been transferred off Nauru. That's been happening for some time," Prime Minister Scott Morrison told 2GB today. "I haven't been showboating about it. I haven't been drawing attention to it. It's being done in accordance with our policies, our existing policies." The public acknowledgment follows a report in today's Australian newspaper revealing there are 40 children left on Nauru, while 244 have been relocated over the last few years. Of those who have been transferred in recent days, 13 have been hospitalised in cities across the country. 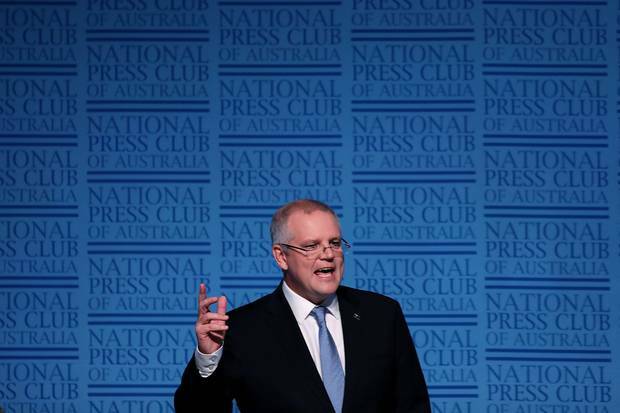 Morrison emphasised the relocations did not represent a weakening of the Government's border policy. "You don't get children off Nauru by putting more children on Nauru by weak border protection," he said. In London, former attorney-general George Brandis also confirmed the Government's plans. "There are hardly any children on Nauru and in New Guinea, and we expect that by the end of this year there will be none," Brandis told LBC radio. The Prime Minister has faced building pressure from within his own party on the asylum-seeker issue. "Nothing should be stopping or delaying us getting these sick children and their families off Nauru," moderate Liberal MP Julia Banks said in a speech last week. "What was a defensible argument in the past is weaker now with the current facts. "In the past few months, the political games and distractions of both parties have disgracefully played out in this place, and in the meantime the situation on Nauru with sick children has reached a crisis point." The pressure has come from the Australian public as well. At the weekend, a YouGov Galaxy poll commissioned by the Sunday Telegraph found almost 80 per cent of Australians wanted the Government to move children and their families from Nauru. "You would have seen on the weekend there was a poll commissioned. Seventy-nine per cent of Australians said they wanted to see children refugees and their families released from detention on Nauru," columnist and Stellar editor-in-chief Sarrah Le Marquand told Today this morning. "I mean, 79 per cent. That is a staggering figure. It crosses all party lines, and I don't think the Government had any choice but to take it seriously. "Now all of a sudden, both sides have realised there are also votes to be found in showing a little bit of compassion. So be cynical. It's the only way when you're looking at our politicians. But I think that they have made the right choice." On ABC News Breakfast, one of the authors of a Unicef report into Australia's treatment of vulnerable children, welcomed the move. "It is good news that the children will be taken off Nauru, something the sector has been calling on for many years. What is important is that durable solutions are found for families and children who have experienced persecution," Freyana Irani said.
.@ljayes on Nauru: We cannot forget the history of the last 20 years. When there has been a relaxation in border policy, the boats have started again and thousands have drowned. The report, released today, says Australia is "not making sufficient progress" with its policies to support disadvantaged children. "While many children in Australia enjoy a good quality of life, for the ones that don't, the extent of the disparity is shocking," Irani said. "We talk about a fair chance for our children, but one in five is starting school developmentally vulnerable, one in six is living in poverty, one in seven has experienced a mental disorder, an youth suicide is the leading and increasing cause of death among children and young people today." The Australian asylum-seeker debate reignited earlier this month when the Government said it was willing to accept an offer from New Zealand to take 150 refugees — but only if Labor agreed to support legislation banning those refugees from ever travelling to Australia. It said the proposal, which was actually introduced to Parliament two years ago but failed to pass, would shut the "back door" into Australia. "Experts are saying that the people transferred to Nauru by Australia are among the most traumatised they have seen, even more traumatised than those in war zones or in refugee camps around the world," the report said. It accused Australia of subjecting refugees to "seriously deficient medical treatment" and "appalling conditions amounting to cruel, inhuman or degrading treatment". "What is happening now on Nauru has gone well beyond our worst fears when this policy was resumed in 2012. Australia's policy has traumatised children so much that they are giving up eating and trying to kill themselves."